October is known for the leaves’ fantastic hues, German beer and festivals, children skipping through the neighborhoods in costume on Halloween. 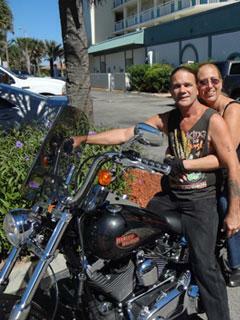 In Ormond Beach it’s known for Biketoberfest. 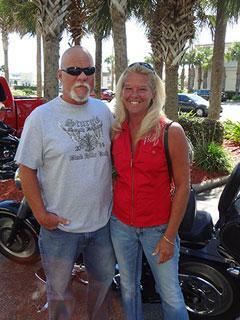 2014 saw approximately 125,000 motorcyclists at the 22nd annual October populous biker gathering that descends on Daytona Beach and Ormond Beach. 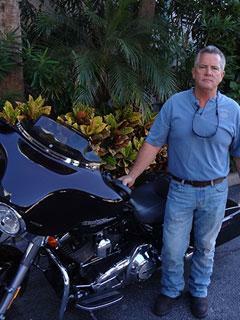 I had our local Royal Floridian staffers ask some Spinnaker Resort owners about their motorcycles. Q: How long have you been coming to Biketoberfest? Q: What kind of bike do you ride? A: Harley-Davidson Fatboy- Love to ride the old classic (like us)! Love to come here during the events and we come every chance we can in between. Great staff. We consider them friends and we’re all still growing up! 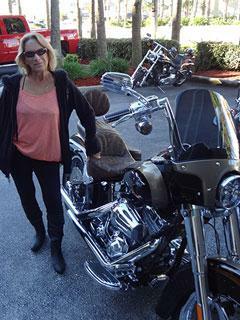 A: I have a 2013 Road King LVO Edition. I truly enjoy it. The ride, the tours – it is the total package. And I am too! A: Harley Davidson. This is a great place to be! A: 2002 Ridley Autoglide. I love my bike. It’s American made in Oklahoma City and it’s an automatic. I ride from Jacksonville to Ormond twice a year for Bike Week and Biketoberfest. I love the Royal Floridian and all of the employees. Everyone is great and the atmosphere is great. Beautiful location! I even come down occasionally other times of the year to enjoy the beach. A: Harley Davidson Street Glide. The staff at the Royal Floridian has been the major reason I return year after year after year! 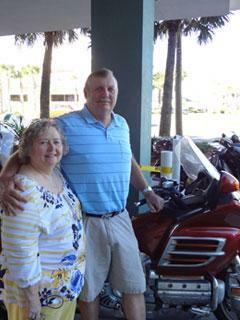 A: Goldwing – great bike, nice and quiet, smooth… no vibration. Love coming to Daytona every year. Great place! 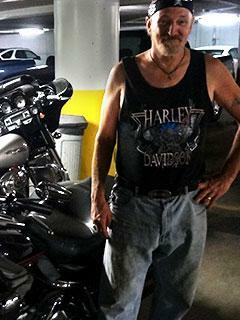 A: 2011 Harley Screaming Eagle- Fast bike and a great ride. A: Daytona is the place to be! 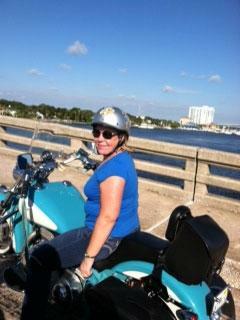 We love it here for the weather and the Biketoberfest event. Having a unit at the Royal Floridian makes it even nicer. We don’t have to worry about a place to stay on the beach. 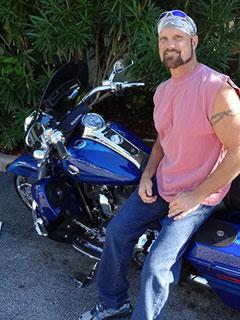 When we ride our ’08 Harley Custom it is the most amazing feeling! Ride free, ride safe! Q: What do you like about Biketoberfest? A: I love to come to Bike Week in October. It’s a little nicer than March and I love the Royal [Floridian], good people and a nice place to come. While I was at it, I thought “Let’s throw a sportbike in the mix”. I may not be a Spinnaker owner but I have an eight-year plus connection with Spinnaker and our owners. I have not been to Biketoberfest before. One year I’d love to trailer it and head down! 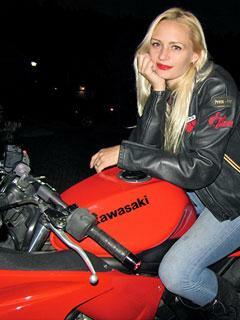 I own a Kawasaki Ninja 600. She’s great for heading to the island, Beaufort or Savannah or finding a quiet back road to open her up some and enjoy. 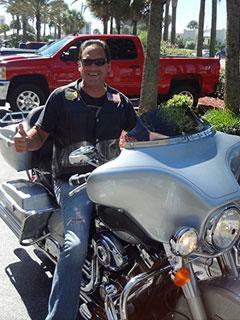 I agree with all of our Spinnaker Resort owner Biketoberfest attendees that two wheel rides are such fun!